I’m 25, live in Australia and am trying to make my weight less of a problem. I also write about work, my puppy and whatever else I can think of. I have an addiction to quotes, my phone is full of them. Words can be so pretty. I don’t know what else to write here so I’m gonna end this with a quote from the glorious Michael Kelso. Please don’t feel any obligation to join in. Thanks for the recent follow, look forward to catching up on your site :). 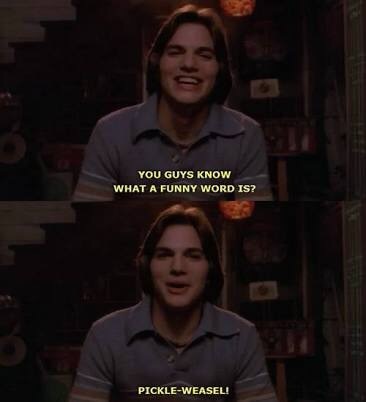 You can never go wrong with the infinite wisdom of Kelso! Hi nice to meet you! You have a wonderful blog would love to follow! Thanks 😊 I love reading your blog too! Thanks for the follow. Love reading about your dog. As puppies, they all win a place in our hearts and its difficult to choose just one. With our last two, they chose us. Welcome to pensitivity101 Hopefully there will be plenty of doggy and weight issues of interest.